…I decide to make doughnuts. I figured why not? My day is already going great, why not throw doughnuts into the mix. I have been craving doughnuts for a while. I think this stem back to when my father and I would play hockey in a neighboring town. After every game we would pick up a dozen doughnuts, eat a couple in the car, and finish off the rest in the morning. Healthy, right? Let’s skate around the ice for an hour and a half and follow up with two doughnuts. I am amazed that my father didn’t have a heart attack sooner. Needless to say, doughnuts went away after that. Well, until now. This doughnut is actually not going to kill you. For one, it is baked and two, I hid whole wheat pastry flour in the chocolate. Can you even tell? There are only 2 tablespoons of butter per six doughnuts (and even that could be subbed with oil but seriously…. you can’t take everything away from me!) So make your Valentine something they will enjoy for a fraction of all those calories! I figured I have had enough fattening sweets for one week, it might be time to do something healthy for Valentine’s day! Preheat oven to 375˚ and spray a doughnut pan. Bake for 7-9 minutes until doughnut springs back. Remove from pan and let cool. 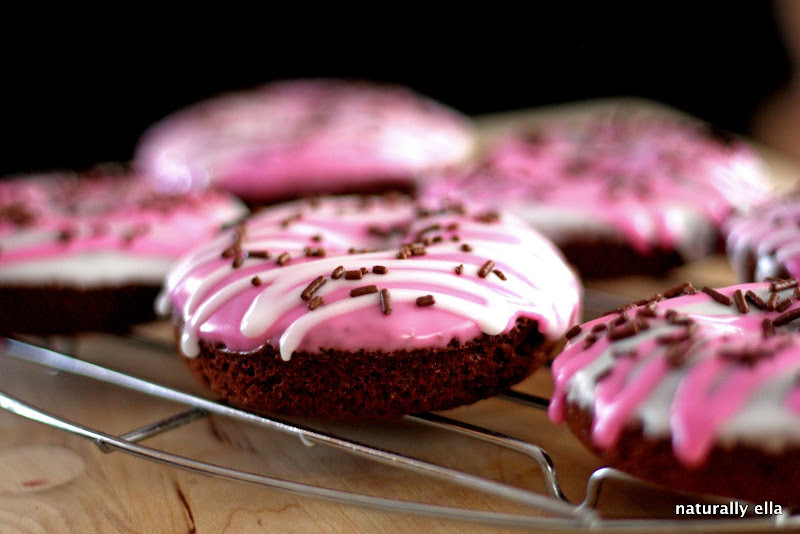 Once doughnuts are cool, prepare icing. 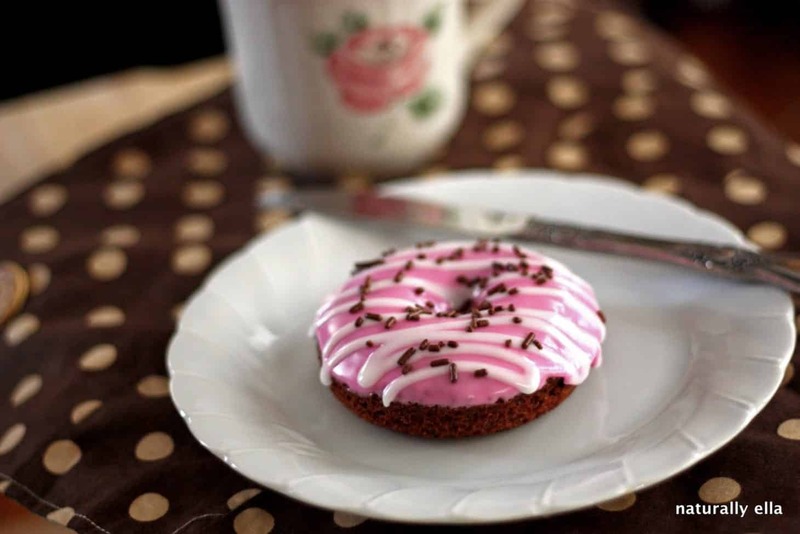 Icing should be not be too runny but should be stiff enough to hold to doughnut. Dip one side of the doughnut in the icing and return to cooling rack. Top with sprinkles if desired. *easily make plain doughnuts by subbing out the cocoa powder and using 2 cups of flour instead of the 1 3/4 cup. Other toppings may include powdered sugar, cinnamon and sugar, or chocolate icing. 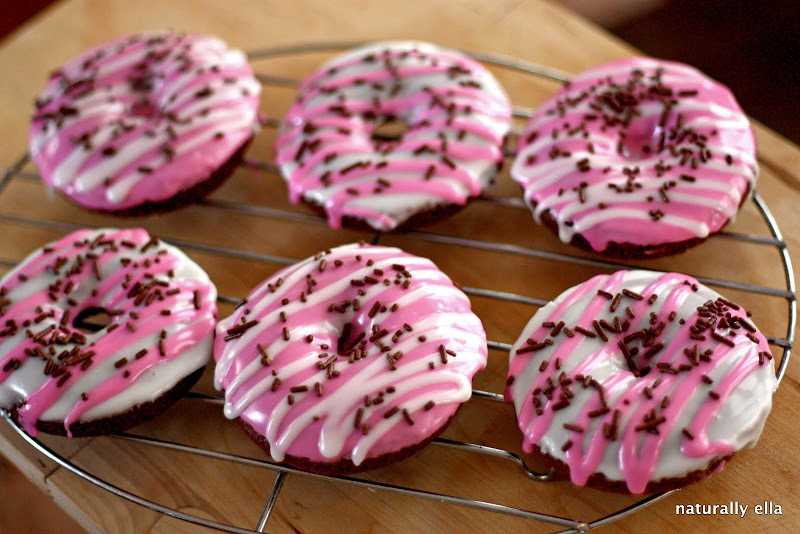 Mmmmmmmmmmmmmmmmmm, donuts. Yours look incredibly good!!! 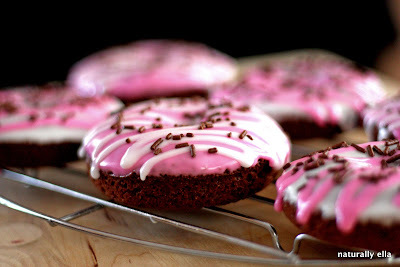 Great idea making baked doughnuts, and I love the way you iced them! That’s great! I love sharing unhealthy food made healthy! I’m seeing doughnuts everywhere! I love that you made a baked version. The decorations are beautiful and festive!